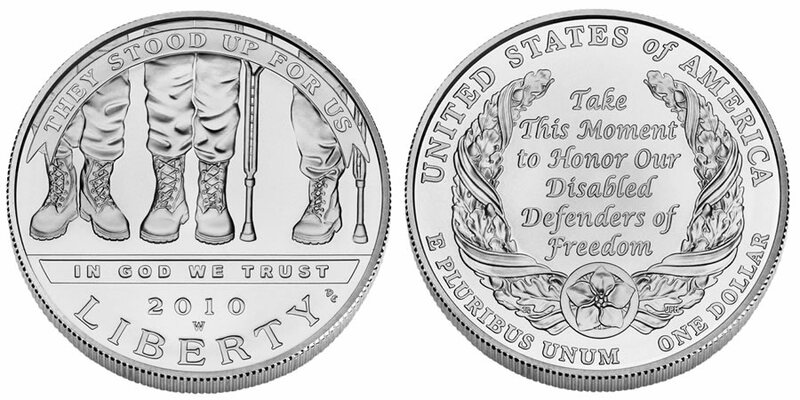 The 2010 American Veterans Disabled for Life Commemorative Uncirculated Coin was released by the United States Mint on February 25, 2010. Struck with a face value of one dollar, the coin contains an alloy of 90% silver and 10% copper. The law authorizing the coin stipulated that a maximum of only 350,000 could be struck across all product options. However, that maximum mintage was not met as demand proved to be less than strong. Both this uncirculated coin and its proof counterpart were struck at the US Mint's facility in West Point. Congress expressed a desire for the coin's to be struck at West Point, but did allow for an alternative facility if needed. 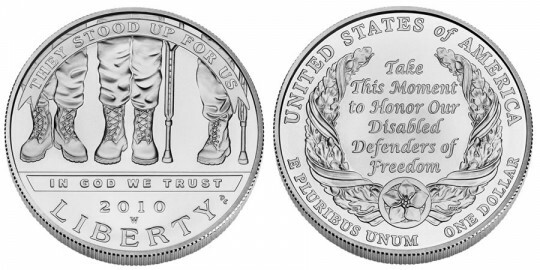 A surcharge was added to the sale of each coin with the proceeds forwarded to aid in the construction of a memorial dedicated to disabled veterans. A proof version of this coin is also being released on the same day. "Take This Moment to Honor Our Disabled Defenders of Freedom" is inscribed in the center of a wreath of oak branches. At the base of the wreath is a forget-me-not flower. It was designed by United States Mint Artistic Infusion Program Master Designer Thomas Cleveland and engraved by United States Mint Sculptor-Engraver Norm Nemeth. Also shown are the inscriptions "UNITED STATES OF AMERICA," "E PLURIBUS UNUM" and "ONE DOLLAR."